October? How on earth have we come to October? First-years have officially started their first week of clinics and the Class of 2017 is MORE than halfway through clinics!!! Bravo! This week you will find me deep in the Large Animal Clinic deciphering the mysteries of the thorax, donning lead, and helping take pretty animal pictures. That’s right…imaging! A LOT of chatter has rippled through the student body about the imaging department because there are currently no permanent faculty, residents, or interns. Suffice it to say that many students are concerned about their imaging education. There is no denying imaging is an important tool for the average practitioner. Radiology is cheap, quick, ubiquitous, and can yield invaluable information. I empathize with all the concerns I have heard and I think it’s the perfect time to make a plug for lifelong learning. Are you ready? This shameless promotion of lifelong learning is directed primarily at the future small animal practitioners in the crowd. Take the frustration you feel about not being able to get what you need from the education sitting on the table in front of you. Now examine that feeling from all angles. Expand your empathy to consider how a small-animal-dominated 50-course meal put on by the College of Veterinary Medicine might not satisfy the hunger of the large animal people in the crowd. Of the exotics people. Of the lab animal people. Of the public health crowd. Of any of the myriad directions vet med could take us that is not cut-and-dried small animal doctor. As a large-animal-interested student of public health, I can tell you that most of my days at this school are frustrating. Clinics are a daily mental struggle because I’m a non-small-animal person living in a small-animal game. I have to tell myself everyday that my inability to remember the nuances of an Addisonian crisis or the metastatic behavior of a mast cell tumor is not an indicator of my future veterinary success. It’s just the gig for right now. Throw me a public health question and I’m on it. Just please don’t ask me about cancer. Please. The real question is…what do we do about these perceived educational shortcomings? Like it or not, at this point in the educational game, deficits in knowledge are on us, NOT our teachers. So how do we fill in the gaps? 1. Find your people on campus. Start local and network like crazy. Don’t be scared of “networking” because it’s just a fancy word for chatting. If we use animal welfare as the example then you might want to go upstairs in the LAC and meet your friendly neighborhood AACUP people (Agricultural Animal Care and Use Program). Talk to your professors and pick their brains. Who do they know? Who can they put you in touch with? 2. Meet people off campus. There are many ways to accomplish this one from hitting up the convention circuit to visiting people that work in your interest area. Start building your network now! If we look at animal welfare then you could go visit the Center for Animal Welfare Science, which is just a hop, skip, and a jump away at Purdue. They have a great 1-day Symposium that happens in the spring. You could take online classes like the ones offered for free from the University of Edinburgh. Lynsee Melchi, Dr. Suzanne Millman, and Ruth Sheppard. The big one you can indulge in during 4th-year clinics is an off-campus rotation. Getting the opportunity to bolster your learning off campus is one of the best things about clinics! Our college has many strengths, such as our unique curriculum, but the diversity of the vet med profession is vast and no one school can cover it all. 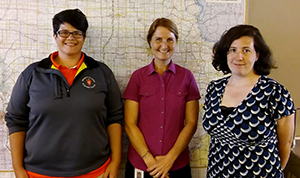 In September a friend and I went to Iowa State’s veterinary school for a two-week animal welfare course taught by Dr. Suzanne Millman, a leading expert in animal welfare and behavior. We got to meet future colleagues, both local and international, while we beefed up our welfare repertoire. The course provided a framework on which to hang our existing knowledge as we learned about legal guidelines, humane euthanasia, welfare assessments vs. audits, and much more. We flexed our welfare muscles anywhere you could find animals from the Blank Park Zoo to a racehorse track. Throughout the course we practiced what we learned by giving class presentations and completing writing assignments. We really enjoyed getting to geek out about animal welfare in a new environment full of new people and ideas. We came back with a fresh perspective on a subject we love. 3. Join an extracurricular club. 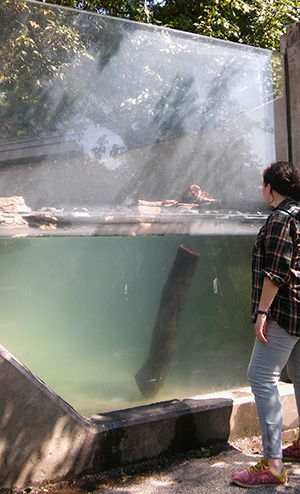 4th-year student Ruth Sheppard evaluates a river otter exhibit for a welfare assessment. Many less traditional areas of vet med are represented on campus through extracurricular clubs. 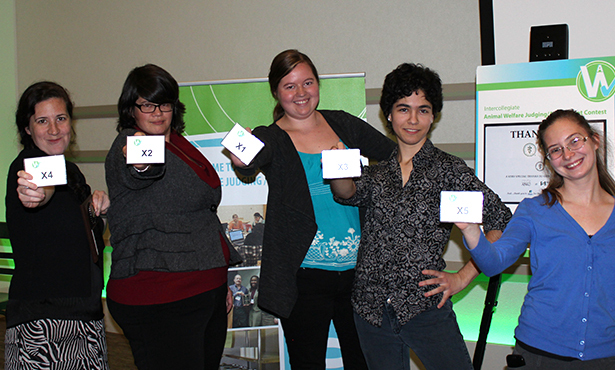 From Surgery Club to VOICE to Integrative Medicine Club, you will find some kindred spirits. I joined the Animal Welfare Club because my big sibling was a founding member. This club is where I cut my teeth on animal welfare. My first activity was the AVMA’s Intercollegiate Animal Welfare Judging/Assessment Contest. At this competition, students participate at veterinary, undergraduate, and graduate levels both as teams and individuals. I heard they might add a DVM category too, so you could participate after graduation. The team assessment is “live” and happens at an animal facility. Teams visit the location, evaluate it, and present a 10-minute group speech on their findings. The individual assessments involve analyzing three species-specific animal welfare scenarios via PowerPoint, ranking which has the best welfare, and giving a three-minute speech defending your position. I liked that I would be speaking as an expert of sorts on subjects I knew almost nothing about like the welfare of captive seals. And would you believe that our ragtag bunch of veterinary bandits captured 5th place overall out of more than 10 schools? (See photo of X-women at top!) This, as a team with no faculty coach, and up against powerhouses of welfare like Guelph and Colorado State. It was so encouraging that I went back the next year and won the whole competition, earning first place in individual scoring for veterinary students. The Animal Welfare Club also gave me the chance to participate in something that brought unique content to the school through my role as vice president. I could go on and on because participation in extracurricular clubs is a great way to learn more about what you love outside of the classroom. 4. If you don’t see what you want…start something new! 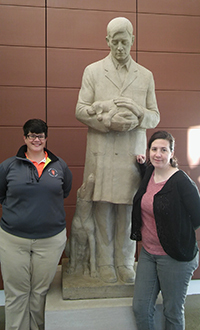 Lynsee Melchi and Ruth Sheppard with “The Gentle Doctor” at ISU. Is there an aspect of vet med that you don’t see represented around you? What are you going to do about that? You could complain to your classmates or you could start your own thing. There was no Animal Welfare Club until recently. A group of students saw a void and filled it with a great club that is continuing to grow. What about being a champion for adding material to our curriculum? The AVMA is coming out soon with a proposed animal welfare curriculum for veterinary schools. It could be you that starts a movement to bring this new curriculum to the college. The possibilities are pretty endless here. 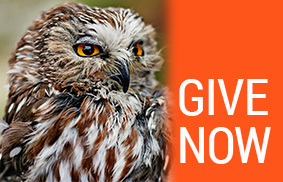 From non-profit to newsletter to mass movement…if you don’t see it…build it! I know it is seductive to want to complain about the things we think we are not getting. But, at this point in the game, we need to step up and get that knowledge by any means necessary. Lifelong learning lasts a lifetime, so there is no better time than now to get started on the journey! For more information about the ISU Animal Welfare Rotation contact Dr. Millman: smillman@iastate.edu. To join the Animal Welfare Club (or the Judging team) contact: awcuiuc@gmail.com.